Our hotel is in Platanias in the region of Kydonia which is one of the most touristic resorts in Crete, near the town of Chania. In our hotel you can enjoy your vacation beside the sea, combining entertainment with rest. You can also enrich your vacation with a tour at the wonderful places of Crete and visit various historical places and monuments that have marked the history of the island and of the country. So, we are waiting for you to see the island and experience the Cretan hospitality. Anna Maria hotel is in the touristic village of Platanias and it is only 40 metres far from the sea. Platanias is a picturesque village by the sea and it is located 11 kilometres in the west of Chania. Our village is offered for rest and entertainment while it maintains its original traditional character. The town of Chania is accessible via plane, boat. 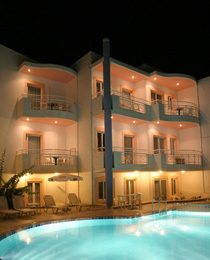 Our hotel is located in Platanias of Kydonia which is 11 kilometres far from Chania.